With filtered search, customers can take advantage of simplified product navigation and shopping. It allows online shoppers to sort through the depth of safety signs and labels that Clarion offers to quickly find the specific products they need. Clarion Safety Systems, a leading designer and manufacturer of safety signs and safety labels, announced today that it has launched a new feature to its clarionsafety.com website: filtered search. In May 2015, the company unveiled a completely updated website, redesigned from the ground up to feature the latest best practice functionality. Features added included an easy-to-navigate design, completely refreshed Resource Center, custom signs and labels section, efficient online account and ordering tools, access to up-to-date thought-leadership, and improved live chat. Now, with the addition of filtered search, customers can take advantage of simplified product navigation and shopping. This enhanced search feature allows online shoppers to sort through the depth of safety signs and labels that Clarion offers to quickly find the specific product they need. “These enhancements that we’ve made to our online presence support our commitment to quality, and to providing unmatched expertise and world-class service to our customers,” says Geoffrey Peckham, CEO of Clarion Safety Systems. 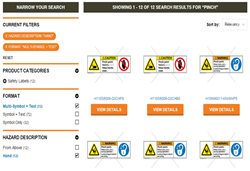 At this time, Clarion’s filtered search allows a customer to search its online catalog using its search bar tool to narrow down the safety sign and label results by two main categories: the format of the product (such as symbol-only or multi-symbol and text) and the product’s hazard description (such as the type of hazard or point of interaction with the hazard). To learn more about Clarion and its new website, visit http://www.clarionsafety.com. Clarion Safety Systems, LLC, is the leading designer and manufacturer of visual safety solutions that help customers in more than 180 industries worldwide to make their products and premises safer. Clarion offers a full range of standard and custom products including machinery safety labels, environmental and facility safety signs, pipe and valve identification markings, lockout/tagout products, and safety-grade photoluminescent egress path-marking escape systems. Founded in 1990, the company continues to play a leading role in the development and writing of international and national standards for safety signs, labels, and markings. Clarion is headquartered at 190 Old Milford Road in Milford, PA, 18337, and online at http://www.clarionsafety.com.